A Midland based company that services the Great Lakes Bay Region and surrounding areas. We provide first class entertainment for Birthday Parties, Corporate Events, Camp and School Functions and so much more! HighCountry Jumpers is a full service inflatable rental company that proudly delivers the cleanest and safest units to our customers. Our main goal is to provide you the friendliest and best service you deserve. You’ve been invited to the Kings Magic Castle for an afternoon of fun. After bouncing in the huge bouncing area you’ll climb the ramp to the double racing slides where you try to race your friends to the bottom. Keep track to see who the big winner of the day is! If it gets too warm, after all the racing, ask the king to help you cool off by opening the retractable roof. Wow! Have you ever seen so many things for your children to do all in one place? This Jumper is an obstacle course with a slide, a climbing wall, a hoop and an obstacle tunnel and a pop-up obstacle lane. Now they find their way to the center of the jumper floor where there is a large slide, split into a climbing ramp to the top then down the slide! You’ve been invited to the Princess’ Magic Castle for an afternoon of fun. After bouncing in the huge bouncing area you’ll climb the ramp to the double racing slides where you try to race your friends to the bottom. This Jumper is enjoyed by boys and girls alike. It starts out with a huge jumping area. The sides of the area are made of sturdy screening that allows people to see what fun the kids are having while keeping them very safe. After jumping they can take off after their friends, up the ramp and down the slide. Let’s play tag and see how many of your friends you can tag out. Time to stretch your child’s imagination with their own private jungle and lagoon. What better way to have fun outdoors than to imagine you’re playing with crocodiles and six of your friends. Imagine sneaking into the jungle and seeing a crocodile then climbing on his feet to slide down his nose or tail, only to do it over and over again. What fun! When they get tired they can take a break in the splash pool below and compare stories about how they got away from the crocodile. Have you ever heard of a Castle on the moon? Well, if bouncing is your thing, with this Castle you and five of your friends can pretend you’re in space or on the moon bouncing until you can’t bounce anymore. See if you can be the ‘star’ for the day and outlast your friends! Have you ever pretended you’re a pirate? Here a perfect way to get your “matey’s”together and face the open seas. You and your friends will be on an adventure of bouncing, splashing and climbing to the top of the wall. When you get to the top there’s a slide that will take you racing down to the water cannons. Oh, no!! Actually, you’ll find that’s so much fun! The best part is you’ll never have to go outside the Pirate Blaster, so no dirty feet. You just go through the inside return tunnel and start all over. Let’s see which pirate gets hit with the cannon blasters the most! Aye Matey! The center of this fabulous Zulu jumper has an 8’x8’ bouncing area. Let’s see who can jump the most and the highest! When you’re all done jumping and getting hot, it’s time to get wet!! Climb the Zulu cliffs from inside the jumping area to one of the two slides giant slides to enter the Tiki Lagoon. If you think it’s just an ordinary slide you’ll be wrong. These fun slides have so much water spraying down on you it makes you feel like you’re sliding down the rapids of a very fast river to the lagoon below. There’s so much fun going on you’ll never want to leave. No party is complete without a popcorn machine! That’s why we offer popcorn machine rentals, either with your bounce house rental or by itself to accommodate for any kind of party you’re having. Renting our popcorn machines with a bounce house is just $50, while renting just the popcorn machine itself is $75. Click below for more information and book your popcorn machine today! Rental is $40 with bounce house and $60 without, ice not included. 1 lb of ice makes 3 snow cones. Syrups are $12 each (gallon size makes 200 snow cones). Flavorings available are grape, cherry, watermelon, & blue raspberry. This is a commercial level snow cone machine which will shave up to 500 pounds of ice per hour to keep everyone cool and refreshed on those hot days! 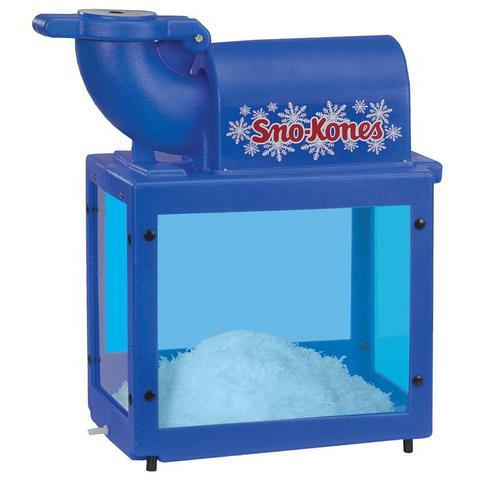 Snow cone machines are great for pool parties, birthday parties, fund raisers, school carnivals, and much more!